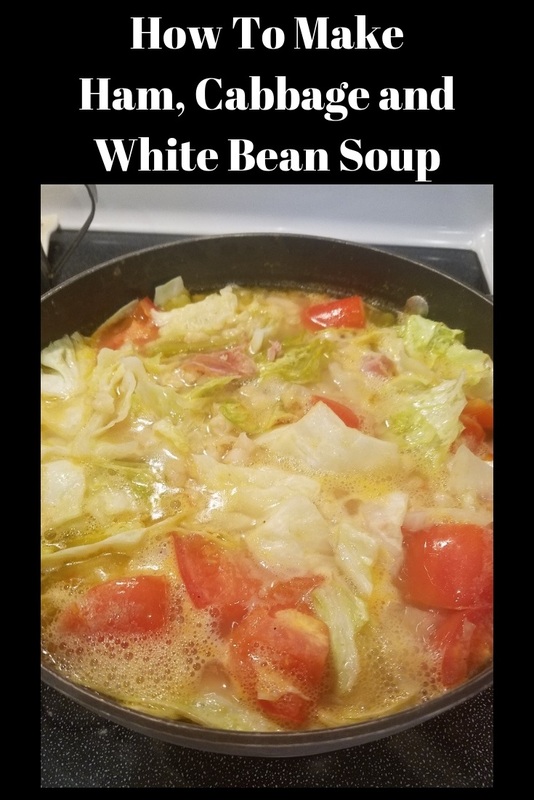 If you want a delicious ham with white beans and cabbage soup this will hit both the spot and the jackpot of all soups! This ham cabbage and white bean soup is a hearty soup will make you crave it often. It's fabulous in flavor! Don't miss out on trying this old classic! It really is the perfect meal on a rainy day. Here in Florida, we don't get much cooler weather, but when we do this tops the lists of must makes. 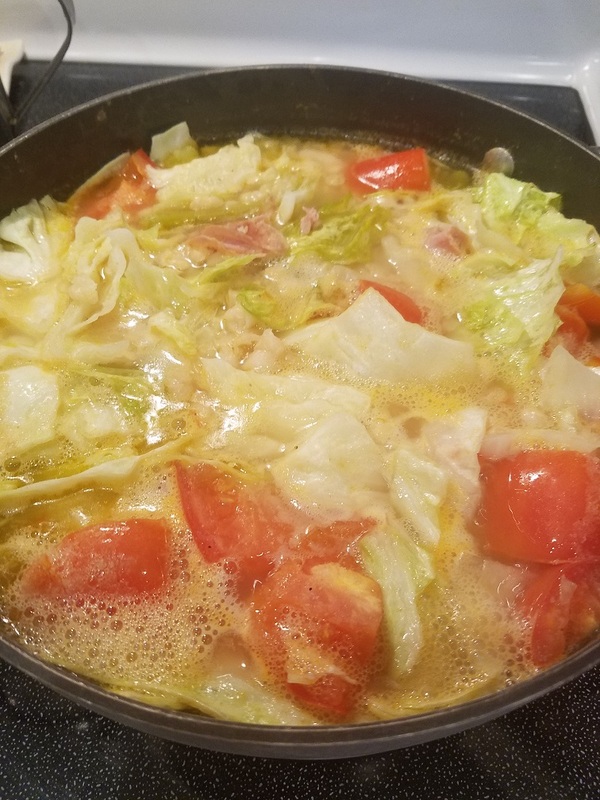 I love the fresh plum tomatoes, carrots, celery, white navy beans and cabbage, it's the perfect combination of flavors. You can use chicken, bacon or any smoked pork to make a great broth. Most soups are low in calories, eat less beans to cut the carbs if watching. The soup is hearty and filling. Great to use up that old ham bone from a holiday. Just stick that ham bone in the freezer to make soup later, we do it all the time. This soup is very economical to make! This delicious soup cooks great all day in a slow cooker, don't be afraid to throw everything in the pot and leave! Try using the slow cooker when your in a huge rush and come home to homemade delicious soup! It sure is a tasty bowl of comfort soup especially when you add some crusty Italian bread or even some homemade corn bread will do just fine. 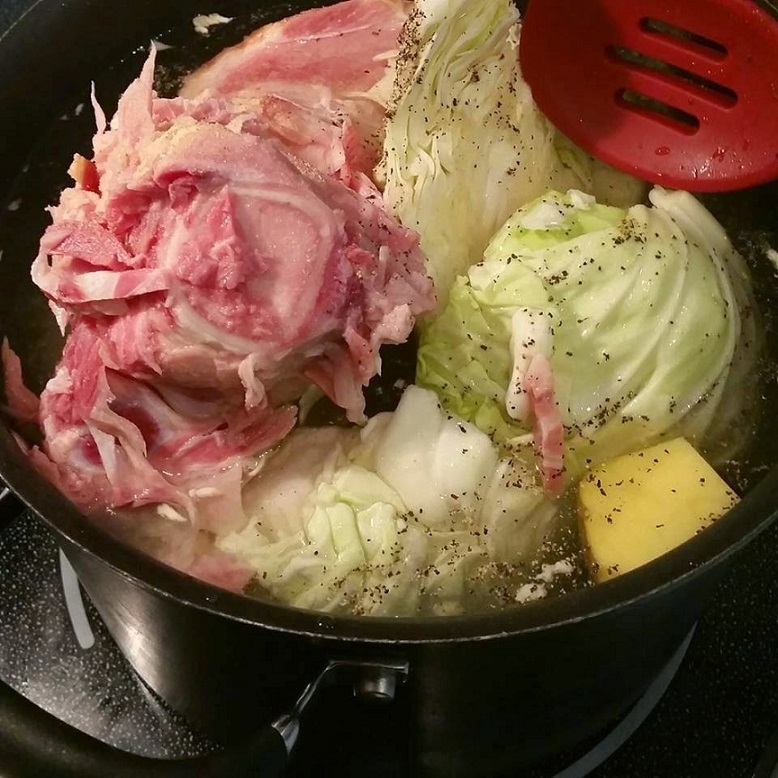 If you're a cabbage and ham lover, this is the perfect bowl of yum for you! You can also add carrots and potatoes or if you're not a potato lover leave them out! If you're looking for a hearty soup, you hit the jackpot with this one. Substitute whatever your family loves! Everything can go in soup! 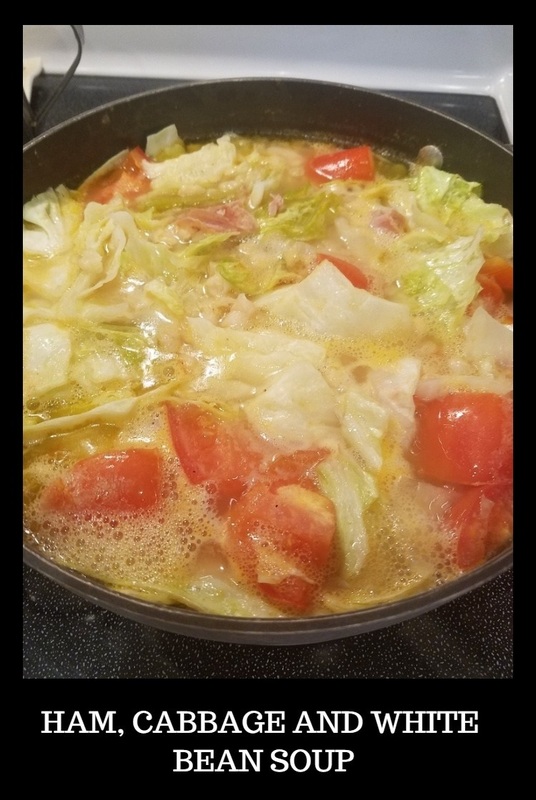 When mom would make this ham, cabbage and white bean soup, I always knew what she was making by it's strong smell and I loved it. I love cabbage, some folks are not too fond of it but it's so healthy for you. 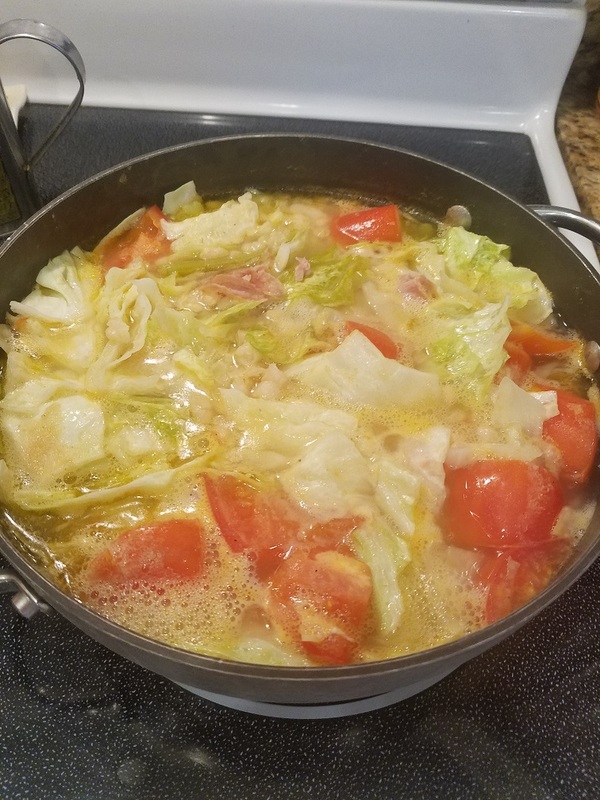 I have substituted other greens in this soup like escarole instead of cabbage which is a much milder green, still the taste will be fabulous. Mom called greens. beans, ham and escarole, minestra. Not sure if I spelled it right. You really can use any greens you prefer. Savoy cabbage which is also referred to as curly cabbage is very good in this soup. My kids prefer all bacon flavor or smoked pork chops off the bone in this soup. Either way it will be delicious! Ham, cabbage and white beans make it a thick broth while cooking, it is an amazing pot of hearty deliciousness! 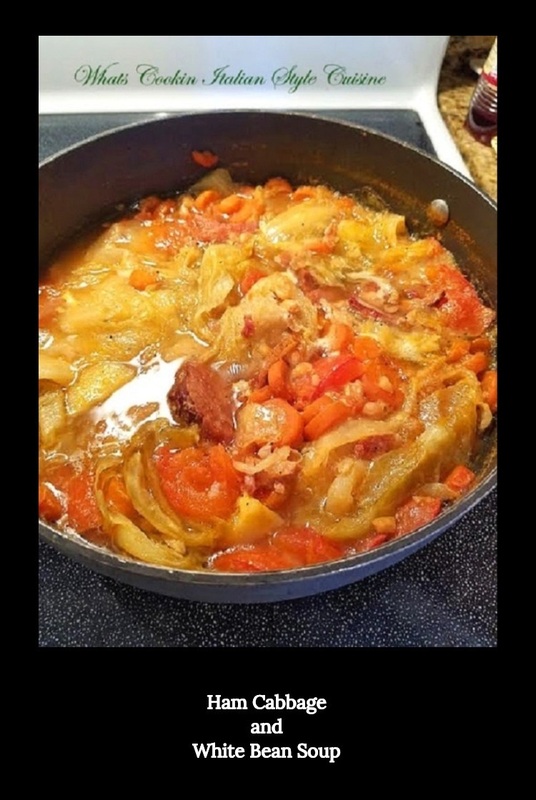 This is a basic recipe for ham and cabbage soup. Sometimes I just add potatoes and whole plum tomatoes. Sometimes I use whatever leftover meats I have even bacon. Anything goes in soup, but a ham bone with cabbage certainly makes a tasty soup. If you're not a fan of beans, don't add them, the soup is delicious and hearty no matter what you add besides cabbage and ham for flavoring. Leftover Ham with bone attached (if it has honey or glaze on it rinse it off with cold water) pull chunks off and add to the pot along with the bone. You can also just buy pre packaged ham cubes to add. Chicken breast, bacon and smoked pork chops work great also! In a large pot, fill water half full, add broth, wine, all the vegetables, ham bone and herbs. Sprinkle to taste with salt and pepper. Cook until all vegetables are tender. Add beans, cook 1/2 hour more. If in need add more water or chicken broth. Remove ham off the bone and add back to the pot. Serve with crusty Italian bread broken up in the bowl... or just dunk it! Try this in the crockpot too! Love, Love, LOVE bean soup - this looks amazing! BRAVO! I love the! My dad used to make it all of the time, but he did not add the beans. We called it a "boiled dinner". That looks so warming and delicious! Just took off a pot of split pea soup, but want to try this one soon. You don't happen to have a recipe for shin beef soup, do you? My mom's was amazing and, sadly, I never got the recipe. I've played around but never gotten it just right. It's dreary. And raining. And gray. I have all the ingredients - except ham - but turkey kielbasa might work. And I am going to bring this honey together. What a comforting bowl of soup! I love your pictures - really gorgeous! I think I'm making this with my ham bone that I have. It looks awesome! It's like a big, happy hug in a bowl :) Looks delicious and warm and perfect! I love this soup, my mom used to make this all the time after Christmas dinner (because we always had ham for Christmas). Yours looks great! This looks delicious, Claudia! There is just something so comforting about bean soup. This will go on my must try list to use with leftover Christmas ham! Yum and buzzed! I love white beans. I was surprised to see all the potatoes in there. Very tasty! 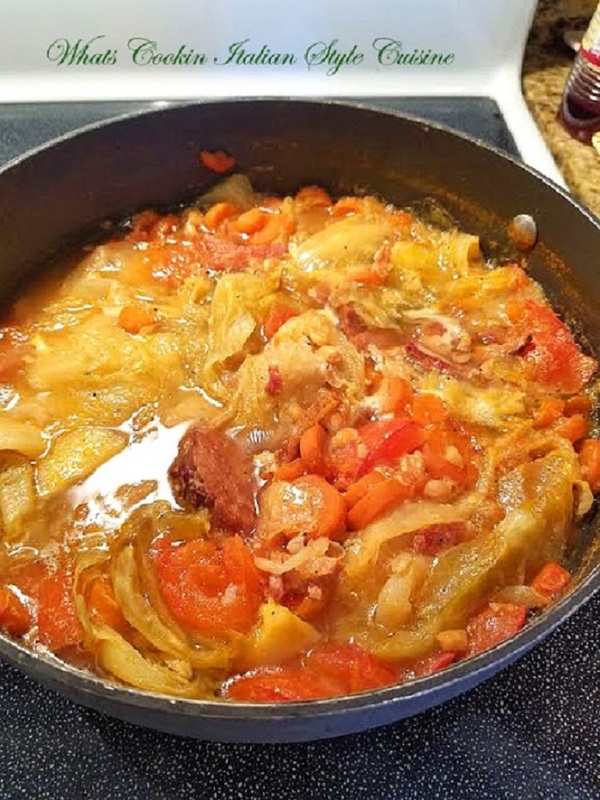 For sure, I would love to make this version of the bean soup in the crock pot, with the ham! Love, love, cabbage in the soup. The ingredients sound amazing! Sounds like a hearty way to use leftover ham. This soup looks delicious!! I would love to try it! This is one I think my mother in law would love. I am going to pass this one on for sure. This soup looks and sounds so hearty and comforting! Simply delicious! I love the combination of ham and cabbage - so delicious. Such a wholesome and delicious soup! I have cabbage and beans in my pantry and I'm going to try it out right away! One of my dad's favorite but we haven't had it with cabbage. Sounds great and we'll be making it very soon! I love a good soup -- even though it's still 85° here in Florida! Great recipe, Claudia! SO yummy! And I love how adaptable it is!! This is the ultimate comfort food for me. I usually don't put cabbage in mine, but now that I see your soup I need to start adding it again. Yum! This sounds perfect with the chilly weather we have here. Can't wait to try it! I love ham and bean soup. This recipe has all the deliciousness that I would expect from a soup like this. Thank you for sharing. Can you please clarify the amount of white wine used in your Ham & Cabbage & White Bean Soup? Thanks for a wonderful recipe! thank you so much for catching that. It's a 1/2 cup of wine. Glad you like the recipe and your welcome, thanks again!